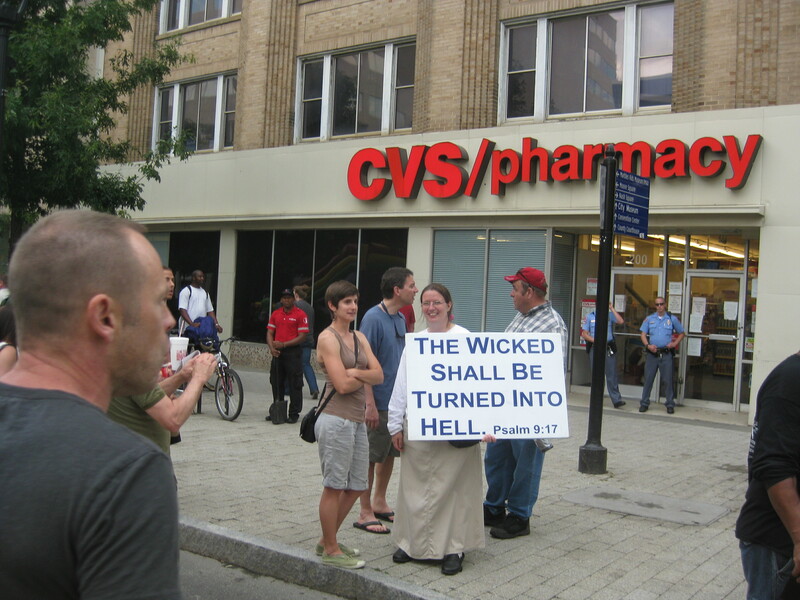 Proverbs 16:6 By mercy and truth iniquity is purged: "and by the fear of the LORD men depart from evil". 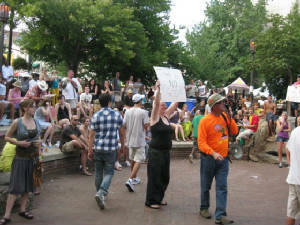 Preaching To The Lost at Riverbend Music Festival June 2012 Chattanooga, TN. 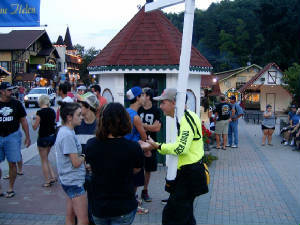 This festival draws over 650 thousands souls annually so Pat O’Connell and I took this tremendous opportunity to go to Tennessee and labor in the Lord’s harvest along with Ricky Nash, Michael Siemer of TN., Brian O’Connell, Joe Hupchick, from Florida, Deb & Rich from the Chicago area, Ron Pollock from Florida, Lance Rowe from all over, Ben & Mary House, and a few other laborers who love the Lord and those who are lost. 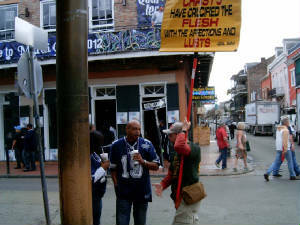 Unfortunately many of those who attended this festival confess to know the Lord Jesus Christ but there hearts were far from Him which was very evident in there unrighteous fruits of fornication, adultery, reveling, drunkenness, homosexuality, sensual dress, and filthy communication that was proceeding out of there mouths. We not only had the opportunity to please our Father by being obedient to His command of living Holy and taking His gospel to the world, but we also had the pleasure of some sweet fellowship with other Brother’s and Sister’s in Christ that were of the same mind, being moved with compassion to see people truly saved. Lance Rowe had the opportunity to minister to a lost couple and lead them to the Lord. 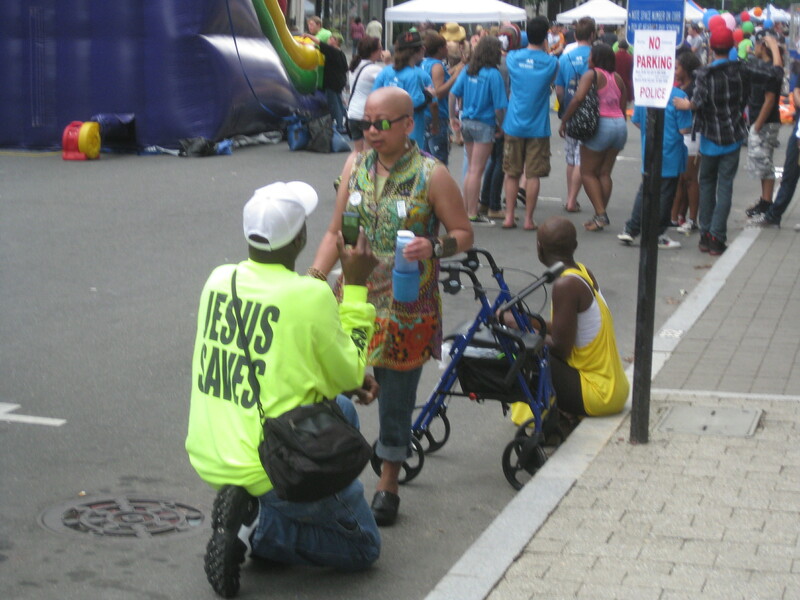 Michael Siemer had the opportunity to lead someone to Christ…Mike even baptized him using a bottle of water. It is appointed unto men once to die, but after this the judgment. Repent and believe while you still have a chance. Are you ready to meet God? The time of the Lord Jesus Christ return to rightfully judge the wicked by unleashing His wrath upon them as was done in the day of Noah must be getting closer then when we as true believers first believed. 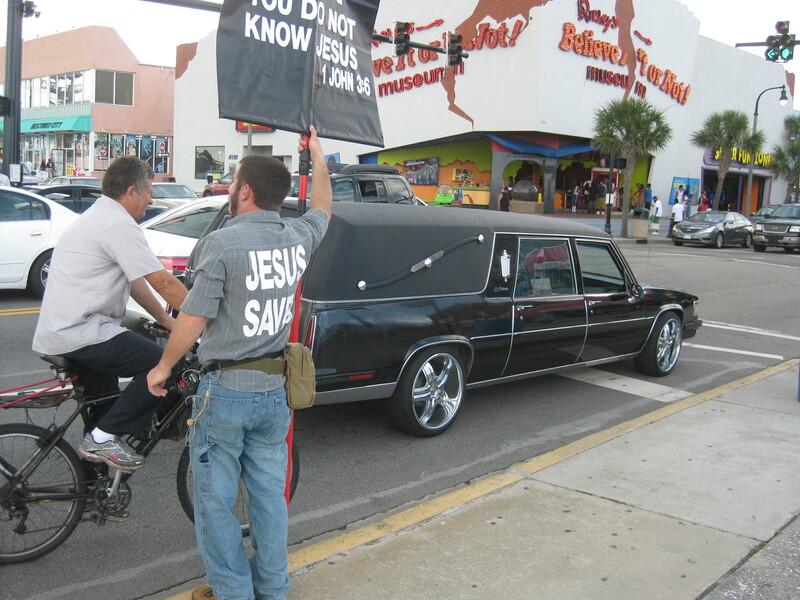 The reason I state this is because this outreach to the lost at bike week to me seemed to be more intense in regards to winning souls. As we preached, witnessed one on one, and prayed for some… the forces of darkness was ever more present increasing their influences upon those fulfilling the lust of their flesh. But as good soldiers we pressed forward knowing that the battle was not ours but the Almighty God Jesus Christ who has ALL power to deliver those who would not only hear His word but also would be obedient to His word and submit to His Lordship to the saving of their souls. Our being obedient to God’s commission, our sacrifices, light afflictions, trials and tribulation is nothing compared to the grace and mercies that God has extended to us that we made partake of his precious gift… eternal life in His kingdom “if” we endure to the end. May his name be lifted up and men be drawn unto Him. For the son of man came to seek and save that which was lost. Revelation 14:14-20 And I looked, and behold a white cloud, and upon the cloud one sat like unto the Son of man, having on his head a golden crown, and in his hand a sharp sickle. And another angel came out of the temple, crying with a loud voice to him that sat on the cloud, Thrust in thy sickle, and reap: for the time is come for thee to reap; for the harvest of the earth is ripe. And he that sat on the cloud thrust in his sickle on the earth; and the earth was reaped. And another angel came out of the temple which is in heaven, he also having a sharp sickle. And another angel came out from the altar, which had power over fire; and cried with a loud cry to him that had the sharp sickle, saying, Thrust in thy sharp sickle, and gather the clusters of the vine of the earth; for her grapes are fully ripe. And the angel thrust in his sickle into the earth, and gathered the vine of the earth, and cast it into the great winepress of the wrath of God. And the winepress was trodden without the city, and blood came out of the winepress, even unto the horse bridles, by the space of a thousand and six hundred furlongs. 2Peter 3:7-18 But the heavens and the earth, which are now, by the same word are kept in store, reserved unto fire against the day of judgment and perdition of ungodly men. But, beloved, be not ignorant of this one thing, that one day is with the Lord as a thousand years, and a thousand years as one day. The Lord is not slack concerning his promise, as some men count slackness; but is longsuffering to us-ward, not willing that any should perish, but that all should come to repentance. But the day of the Lord will come as a thief in the night; in the which the heavens shall pass away with a great noise, and the elements shall melt with fervent heat, the earth also and the works that are therein shall be burned up. Seeing then that all these things shall be dissolved, what manner of persons ought ye to be in all holy conversation and godliness, Looking for and hasting unto the coming of the day of God, wherein the heavens being on fire shall be dissolved, and the elements shall melt with fervent heat? Nevertheless we, according to his promise, look for new heavens and a new earth, wherein dwelleth righteousness. Wherefore, beloved, seeing that ye look for such things, be diligent that ye may be found of him in peace, without spot, and blameless. And account that the longsuffering of our Lord is salvation; even as our beloved brother Paul also according to the wisdom given unto him hath written unto you; As also in all his epistles, speaking in them of these things; in which are some things hard to be understood, which they that are unlearned and unstable wrest, as they do also the other scriptures, unto their own destruction. Ye therefore, beloved, seeing ye know these things before, beware lest ye also, being led away with the error of the wicked, fall from your own stedfastness. But grow in grace, and in the knowledge of our Lord and Saviour Jesus Christ. To him be glory both now and for ever. Amen. Luke 17:33 Whosoever shall seek to save his life shall lose it; and whosoever shall lose his life shall preserve it. 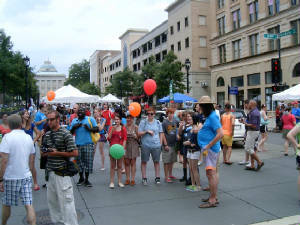 This ungodly event masquerading as a family-friendly “All families Matter” (in their words) along with the city of Raleigh police department attempted to shut down the preaching of the gospel of Jesus Christ which truly is their only hope. 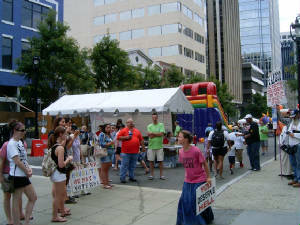 We were seriously threaten with arrest if we did not leave, But thank God for the boldness that was demonstrated by our party who stood up for our fortunate rights we have in “this country” to be able to “PREACH” the gospel freely without permits, and unreasonable constrains in public settings. 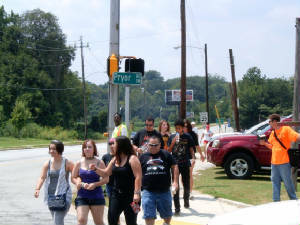 After our unfortunate confrontational standoff with the Raleigh Police officers it was very evident that this battle was and is spiritual in nature for “Living and eternal souls”. Throughout the day of crying aloud (Isaiah 58:1) against wickedness, and religious hypocrisy having a form of godliness without its power (to deliver from sin) our team encountered many one on ones with those who the Holy Spirit was drawing out of this darkness. The “living word” of God went forth as God intended for it to be, and He shall perform His word in the hearts and minds of the hearers. Rom 10:14 “How then shall they call on him in whom they have not believed? and how shall they believe in him of whom they have not heard? and how shall they hear without a preacher?” That is a true preacher that is uncompromising and not tickling the hearer ear. May the Lord Jesus Christ be glorified on earth through the lives of those this day who decided to lay down their lives and pick of their cross and follow him even unto death. 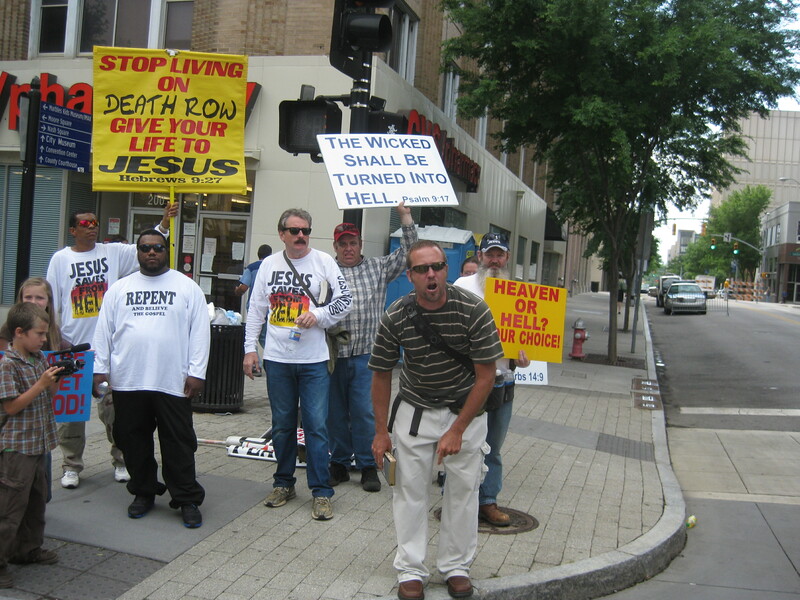 Matthew 5:10-16 Blessed are they which are persecuted for righteousness' sake: for theirs is the kingdom of heaven. Blessed are ye, when men shall revile you, and persecute you, and shall say all manner of evil against you falsely, for my sake. Rejoice, and be exceeding glad: for great is your reward in heaven: for so persecuted they the prophets which were before you. Ye are the salt of the earth: but if the salt have lost his savour, wherewith shall it be salted? it is thenceforth good for nothing, but to be cast out, and to be trodden under foot of men. Ye are the light of the world. A city that is set on an hill cannot be hid. Neither do men light a candle, and put it under a bushel, but on a candlestick; and it giveth light unto all that are in the house. Let your light so shine before men, that they may see your good works, and glorify your Father which is in heaven. 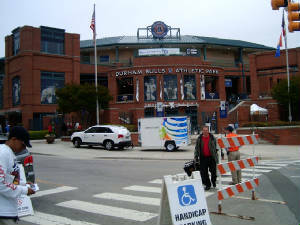 Durham Bulls Game Open-air Preaching to the same kind of lost people as was in the day of Noah. Click here for youtube clip. Praise God…His word is powerful and will not return unto Him Void. · All power is given unto me in heaven and in earth. Go ye therefore, and teach all nations, baptizing them in the name of the Father, and of the Son, and of the Holy Ghost. Teaching them to observe all things whatsoever I have commanded you: and lo I am with you always, even unto the end of the world. 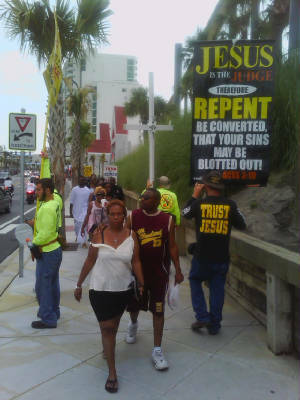 From that time Jesus began to preach and to say “Repent” for the kingdom of heaven is at hand. 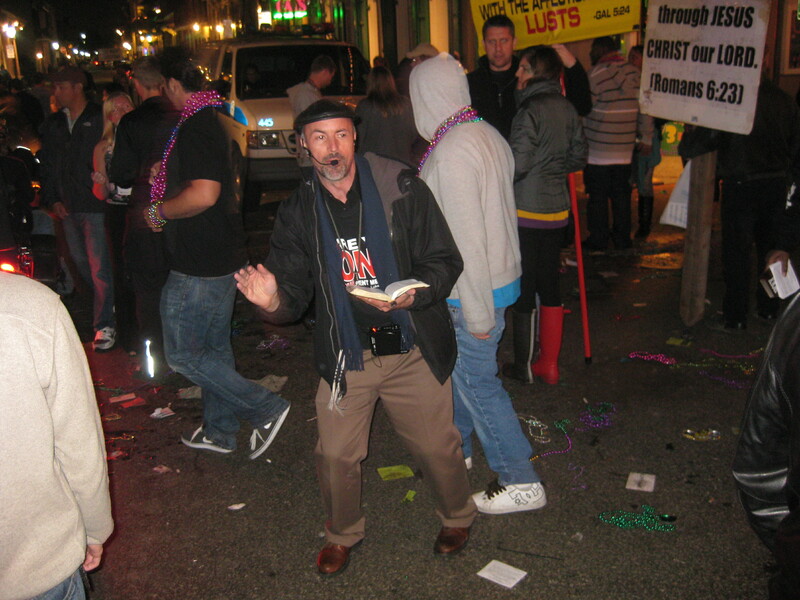 Being obedient undeserving servants Pat O’Connell and I embarked on our fifteen hour journey to one of America’s most wicked festivals to preach repentance for the remission of sins to the thousands of lost souls whom Christ died for. Fortunately the command of God to preach “His gospel” was also adhered to by a few other hundred Saints that came from a far and near to labor in the Lord’s harvest. 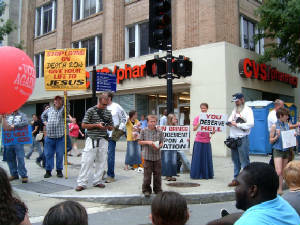 In doing so we were able to see the Lord glorified by the souls that were plucked from the store steps of hell fire and others who were ministered to that we pray will have no more pleasure in their sins and will repent and cry out to God before it is too late. The scriptures clearly let the believer know that our walk in Christ is a battle, not a physical one but spiritual in nature…A battle where we are fully equipped through Christ to win…utilizing the weapons He has provided for us. Nonetheless it is still a battle, a war where we have an enemy that is relentless, attacking “at all times” in the spiritual realm with the attacks against us being seen and felt in the physical realm. We unfortunately at times forget about this spiritual war especially when “things around us seem to be going alright”. But being on the frontline in crusades such as this I am constantly reminded that this is truly a “WAR” a war for lost deceived souls. A war where there are casualties, and eternal fatalities. Where the enemy with his cunning devices has been successful in distracting and defeating not only the unbeliever, and sinners, but also some of my fellow Saints, and if I’m not careful, diligent, prayerful, focused on… and abiding in Christ always I too will be a casualty or even an eternal fatality of this war for eternal souls. 1Peter 4:17-19 “For the time is come that judgment must begin at the house of God: and if it first begin at us, what shall the end be of them that obey not the gospel of God? And if the righteous scarcely be saved, where shall the ungodly and the sinner appear? Wherefore let them that suffer according to the will of God commit the keeping of their souls to him in well doing, as unto a faithful Creator”. 1Peter 5:8-11 Be sober, be vigilant; because your adversary the devil, as a roaring lion, walketh about, seeking whom he may devour: Whom resist stedfast in the faith, knowing that the same afflictions are accomplished in your brethren that are in the world. But the God of all grace, who hath called us unto his eternal glory by Christ Jesus, after that ye have suffered a while, make you perfect, stablish, strengthen, settle you. To him be glory and dominion forever and ever. Amen. It is easy for me to see why when those of us embark on making the reasonable sacrifice of living holy, and coming to an event like this, we encounter what seems to be intense opposition, trials, tribulations, and in some cases hardship. Reason again…”war for eternal souls”. 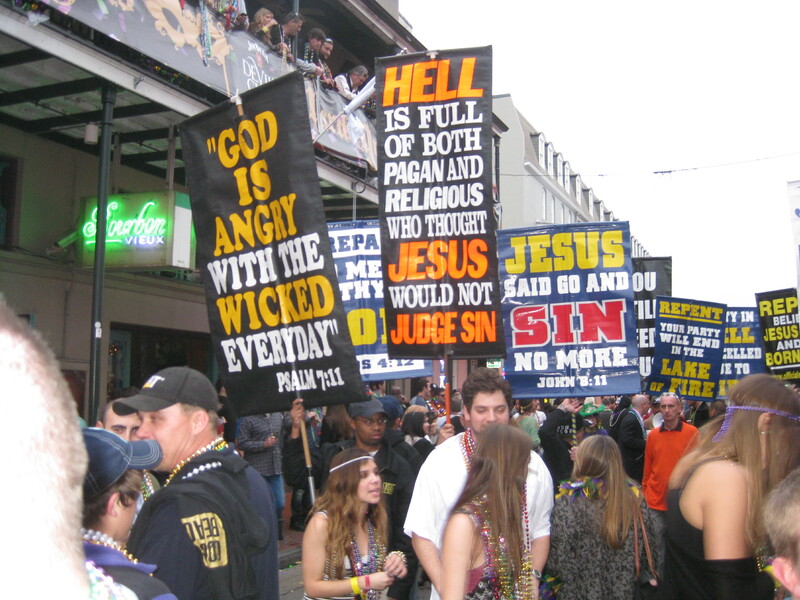 In the mist of all the wickedness of Mardi Gras we have seen the miraculous power of God through His Holy Spirit to truly save souls who initial intentions of coming to this party was for anything other than meeting the living Christ. 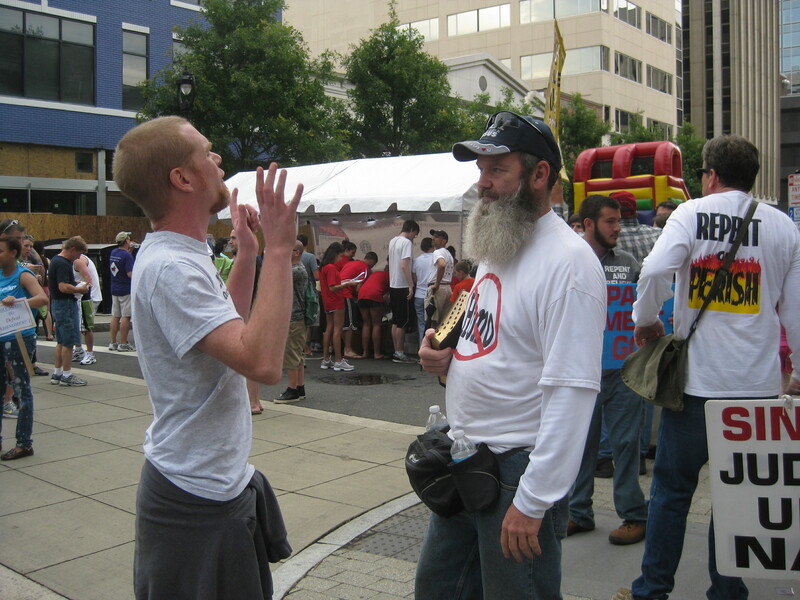 · Over Walter who heard the preaching of the gospel and turned from his sins threw his beer can away and recommitted to following Jesus. · Robert and Ineil who knew the word but needed encouragement to be doers of the word to the saving of their souls. 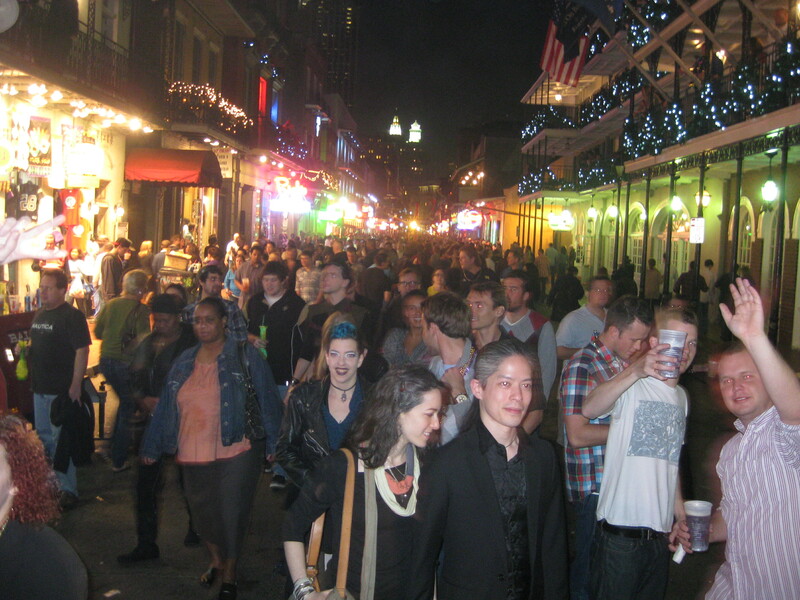 · Over a young lady that was demon possess and was delivered by the laying on of hands and set free right smack in the middle of the intersection of Bourbon & St. Peter with thousands of revelers passing by. She started calling upon that one and only name that truly saves…JESUS. 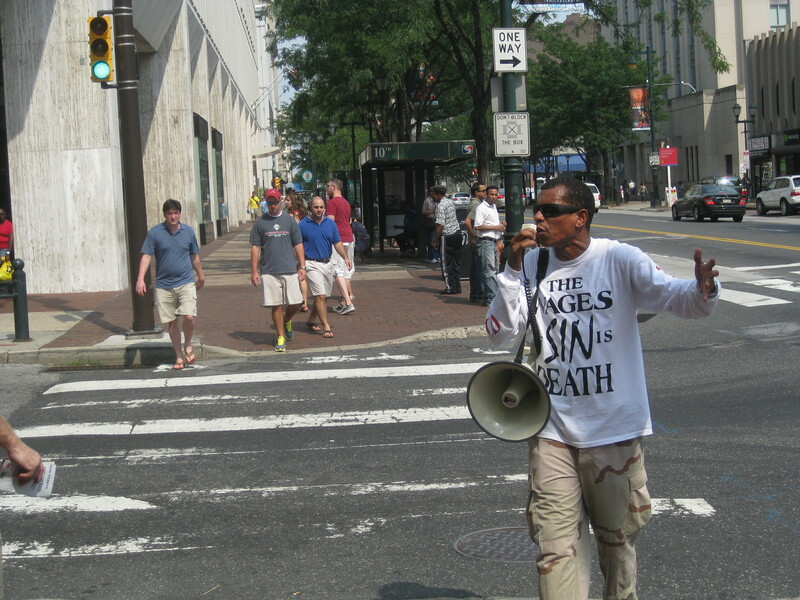 · Over Terrance a young man that heard the preaching of the gospel and asked Jesus to save Him. 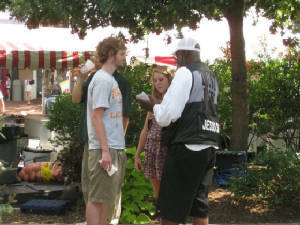 · Over two young men who were walking pass with their friends but was arrested by the Holy Spirit and asked for prayer to be set free from their sins. There were others that heard the preaching of the gospel and some that we ministered to that were convicted concerning sin, righteousness, and judgment just as Jesus proclaimed would be the case when He departed and sent the Holy Spirit into the world. 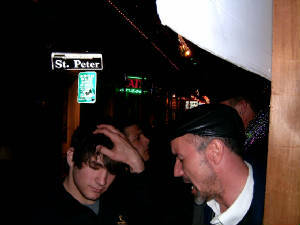 As our time in New Orleans began to wound down, and our physical bodies began to wear from the long days and nights in the streets... not getting back in some mornings until 4:30AM. It would have been very easy for us to say let’s take a break on any day or night. But as good soldiers we pushed on, and in doing so we experienced God’s power demonstrated, by signs and wonders. As stated earlier there were hundreds of other Saints of God here fulfilling the great commission among the estimated 1.8 million revelers. 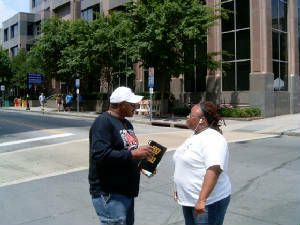 Some of them too reported salvation and testimonies from the street. Not the believism just confess Christ continue to sin you will always be saved salvation, but genuine repent and be converted salvation…to our God be the glory. 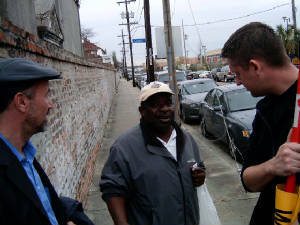 On December 28th in the afternoon of the year of the Lord Jesus Christ… Pat O’Connell came up to Durham from New Bern NC and we drove to the Charlotte area and hooked up with Brian Cranford to take the gospel to the streets.. We then proceeded on our long journey to Louisiana New Orleans to preach repentance and remission of sins as commanded by our Lord Jesus Christ to the tens of thousands reveling lost souls whom He died for that will end up in hells fire lest they truly repent. Pardon me as I digress for a moment as I am reminded of the many years of my Christendom spent in the “organized” church we always brought New Years in huddling together in our buildings reveling, praying, and prophesying blessings over each other for the coming year neglecting the great commission to the dying world to “preach” the gospel to the lost opening their eyes, and to turn them from darkness to light, and from the power of Satan unto God. Lord forgive us of not truly dying to self and taking up our cross and following you. Back from my digression…The Lord Jesus Christ who was and is “always” moved with compassion for lost souls as we should be allowed us to work in His Harvest once again. 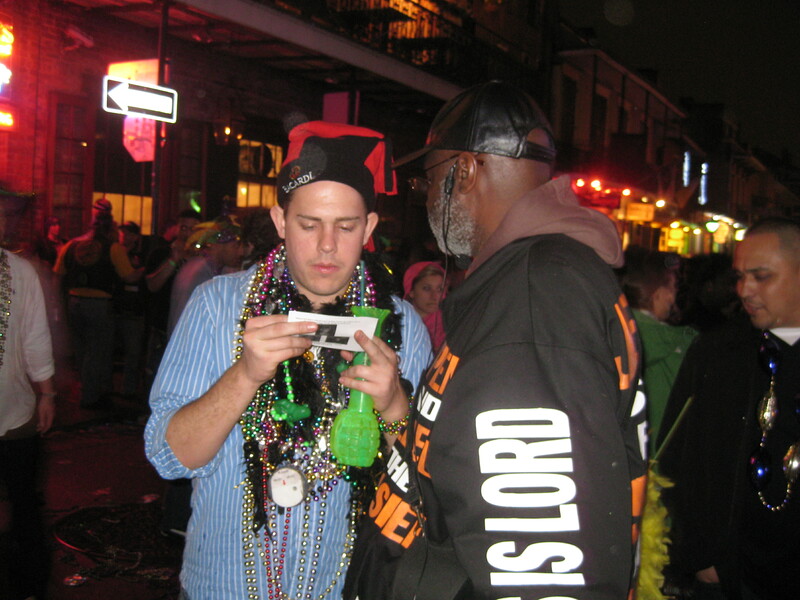 I personally thank the Lord for allowing me this opportunity an unworthy servant to partake of this labor seeing His power, grace, and love demonstrated in the mist of all the debauchery, evil, and wickedness. 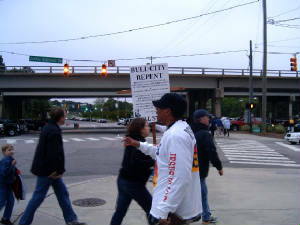 In preaching the gospel we experienced his mighty power demonstrated through the Holy Spirit reproving the revelers of sin, righteousness, and of judgment while at the same time drawing those that would heed to His "living word" and escape the wrath to come on all the children of disobedience. 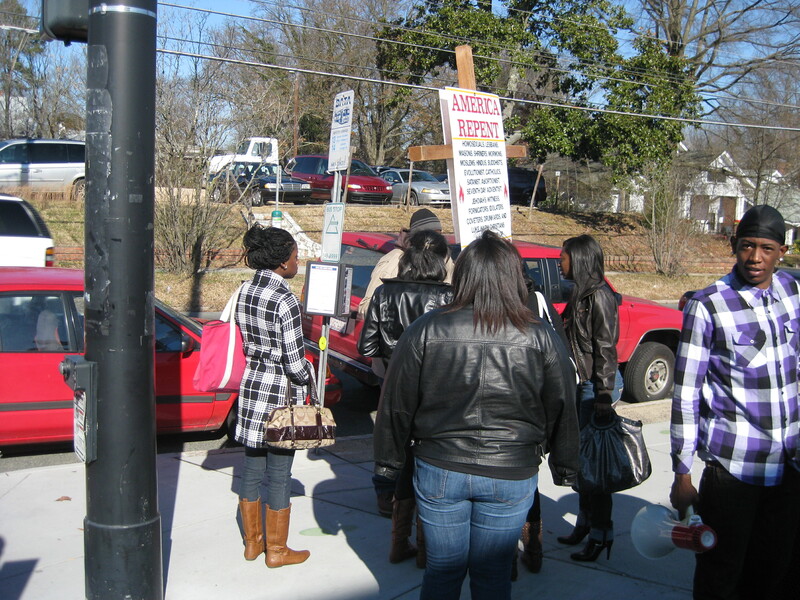 We also had the opportunity to minister one on one, one on two, one on three, and many throughout this outreach some receiving the truth, but as the scriptures says many rejecting the truth choosing the pleasures of sin and staying on the board road of destruction. 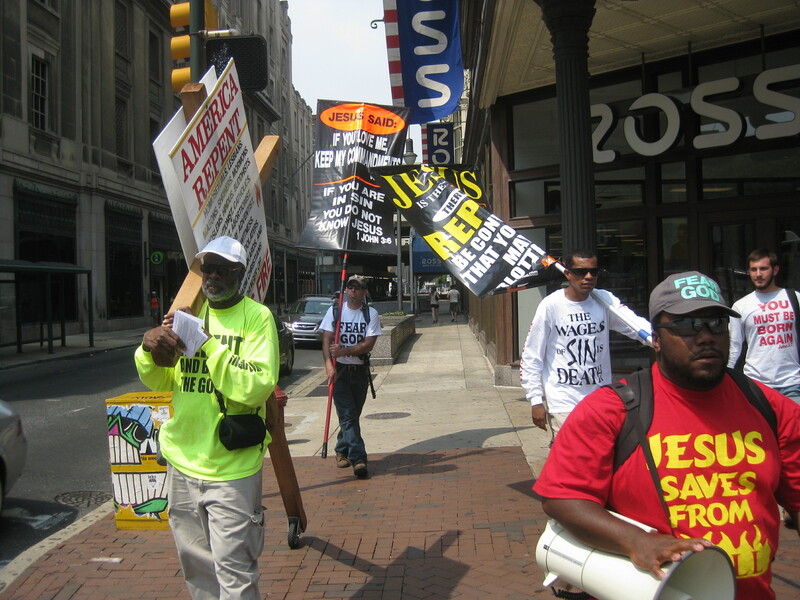 The preaching of the cross is foolishness to them that perish but to them that are saved it is the power of God. Some Christians adhere to “another” way to reach the lost such as building relationships with them first, or by the entertainment gospel, or by the smooth tickle my ear no hell preaching gospel, or even by the easy believe don’t ask me to carry my cross I want my best life now gospel (hearer not a doer), and many other non biblical ways. The foundation is Christ… folks He is the same yesterday, today and forevermore. Time is really short people…God is long suffering but His wrath is soon to come on the ungodly… will they be caught in there ungodliness during the day of God’s wrath and you there sitting at a table with them building a relationship talking about careers, education, politics, sports, your week-long bless the Pastor bless me conference, and not telling the sinner that God has commanded him or her to repent of their sins “TODAY” before it is to late 2 Corinthians 6:2, Hebrew 9:27. Whose blood will their hands be on? Something else to think about…therefore to him that knoweth to do good and doeth it not to him it is sin. 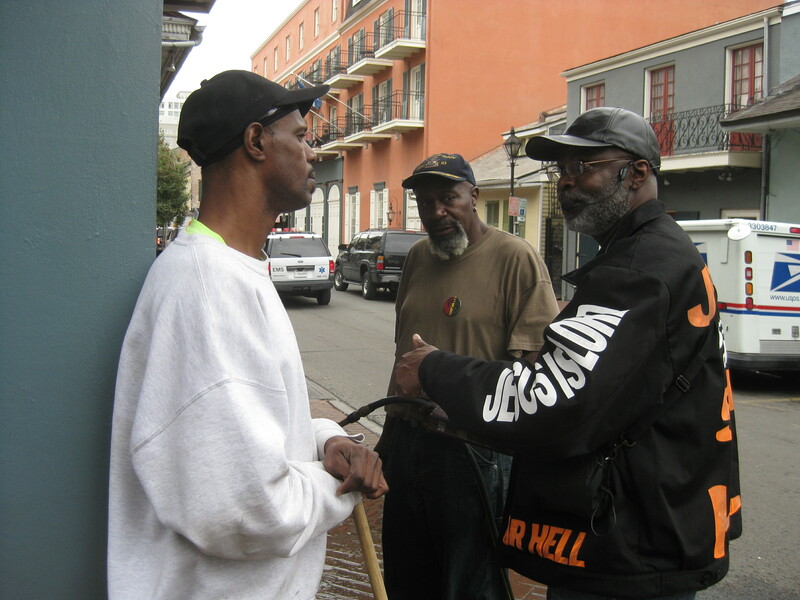 This past outreach to the lost souls that God loves brought about not only persecution for the gospel sake but also bodily harm to some brothers…being punched in the face, spit upon, burned with cigarettes, etc. I share this not to boast about suffering for Christ for these are light afflictions that should be expected in following Christ according to the Bible (basic instructions before leaving earth). May I remind you that they punched the Lord, pulled out his beard, and whipped Him, spat upon Him, no telling what else and ultimately crucified Him? Other true followers of His and even to this day were and are, slain, mocked, destitute, afflicted, casted out by family, and imprisoned for keeping the faith. The reason I share this other side of working in the Lord’s Harvest is because it is part of the work and in the mist of all the above I also feel as though this has been one of the most fruitful outreaches I have been a part of in a long while. I truly believe that there will be fruit that remains from this outreach. 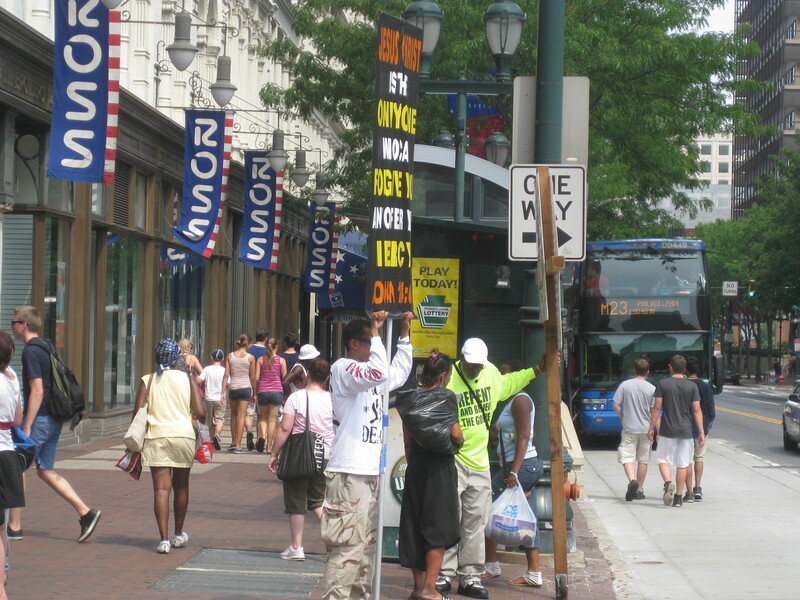 There were many testimonies of people being touched by the preaching of the gospel. Luke warm Christians being stirred to do more, sinners repenting, Brothers and Sisters in Christ strengthen and ultimately God being glorified. 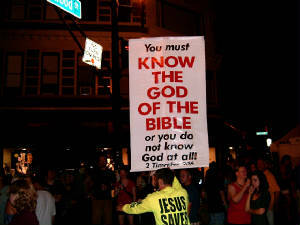 “God knoweth your hearts: for that which is highly esteemed among men is abomination in the sight of God”. 1Corthians 1:25-31 Because the foolishness of God is wiser than men; and the weakness of God is stronger than men. For ye see your calling, brethren, how that not many wise men after the flesh, not many mighty, not many noble, are called; But God hath chosen the foolish things of the world to confound the wise; and God hath chosen the weak things of the world to confound the things which are mighty; And base things of the world, and things which are despised, hath God chosen, yea and things which are not, to bring to nought things that are: That no flesh should glory in his presence. John 15:18-20 “ If the world hate you, ye know that it hated me before it hated you. 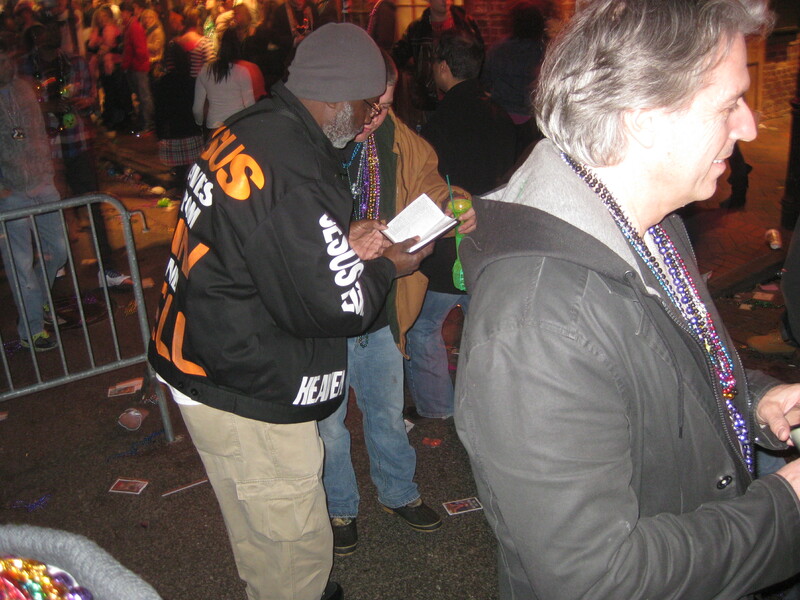 As we ministered to not only those in New Orleans but also to those who paths we crossed there and back we pray that the word that went forth fell on good ground and will produce that which the Lord has intended for it to produce. Fruit that remains. For the believers who read this letter and have a compassion for the lost if you are lead by the Spirit of God please agreed with me in prayer for the many souls that were ministered to at this outreach that their eyes will be open to the truth, that they will have no more pleasure in their sins, and turn from darkness to light, and from the power of Satan unto God, that they may receive forgiveness of sins as we have received and they shall receive the inheritance as we received by faith in the risen Christ. Mat 9:36-38 But when he saw the multitudes, he was moved with compassion on them, because they fainted, and were scattered abroad, as sheep having no shepherd. Then saith he unto his disciples, The harvest truly is plenteous, but the labourers are few; Pray ye therefore the Lord of the harvest, that he will send forth labourers into his harvest. 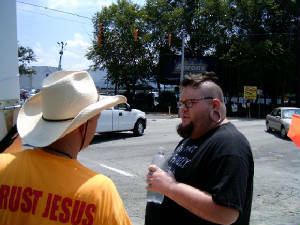 One of the many things wrong with the 21 century "apostate organized church" is this self proclaimed Youth "Pastor" with the ear lope enlargement, body piercing, worldliness and such in the picture below attending the Megafest rock concert in Atlanta, Ga. He also believes in the damnable Once saved always saved can't lose your salvation doctrine. 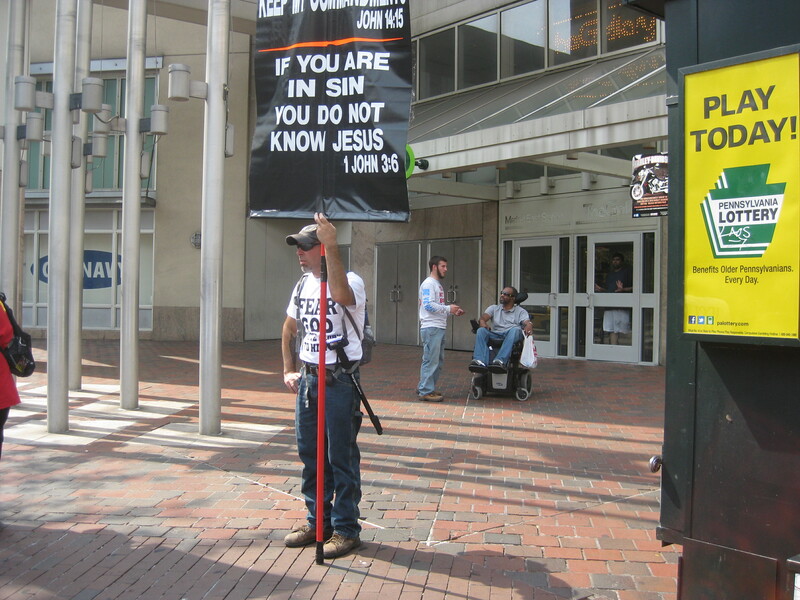 Which probably explains why he hasn't departed from sin? Pat O'Connell reasoning with this "Youth Pastor"
2 Timothy 2:19b Let every one that nameth the name of Christ depart from iniquity. 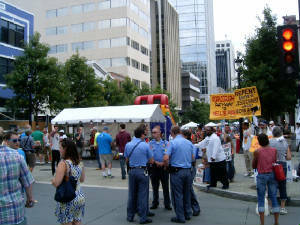 Well… Bele Chere Festival in Ashville NC has come and gone. 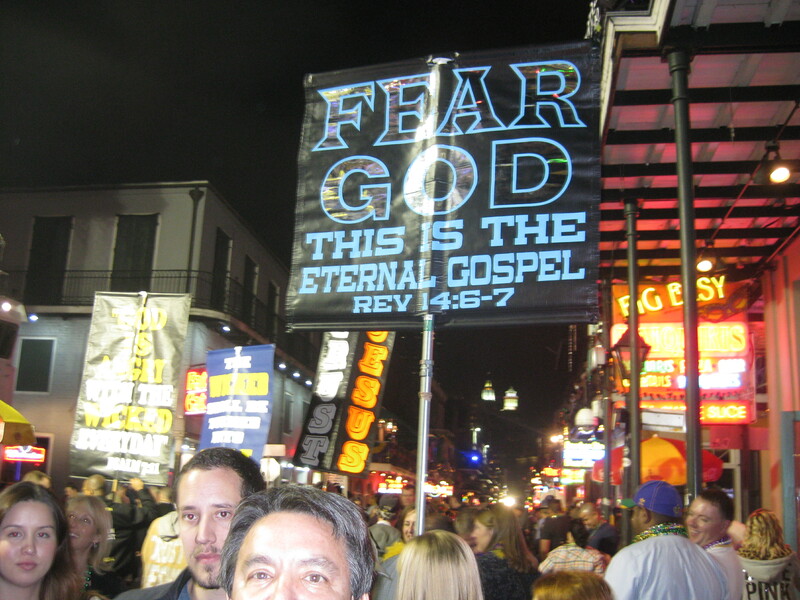 Jesus Christ disciples from around this nation who were moved with compassion for the lost attended this festival of 300,000 to 350,000 souls preaching the gospel message “Repentance for the remission of sins”. 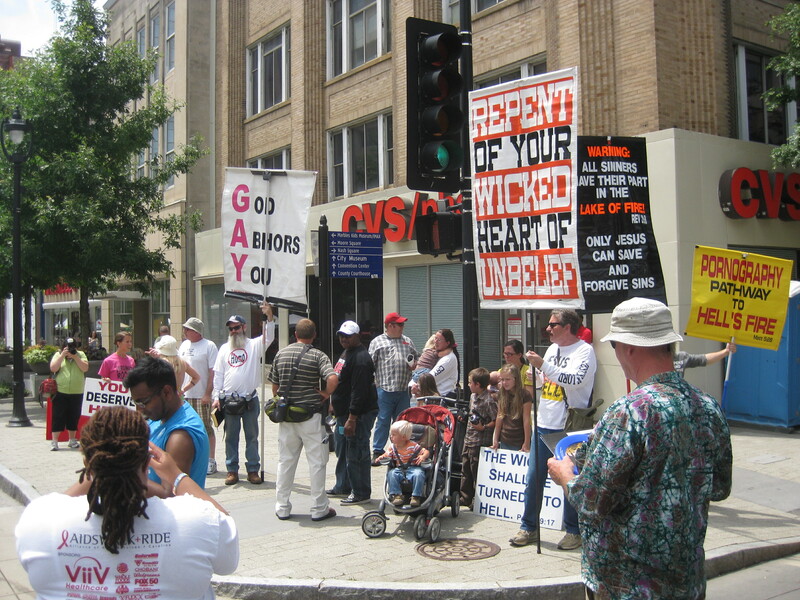 Enduring the hatred of the lost who hated that their wicked deeds were revealed, but also the hatred, and discontent of the many religious crowd that were professing to be saved while continuing in their sins loving it so, and declaring that they and others that do such will enter God’s Kingdom in their sins. 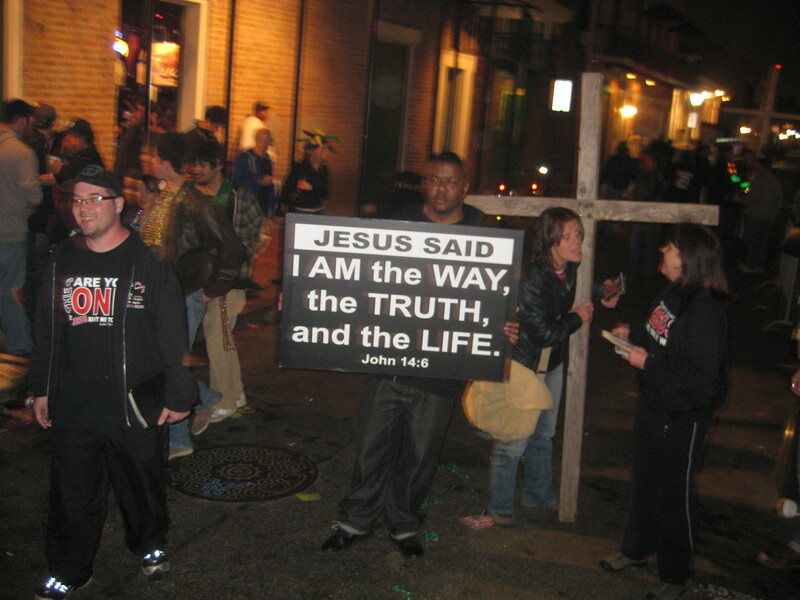 Romans 10:14-15 How then will they call on him in whom they have not believed? And how are they to believe in him of whom they have never heard? And how are they to hear without someone preaching? And how are they to preach unless they are sent? 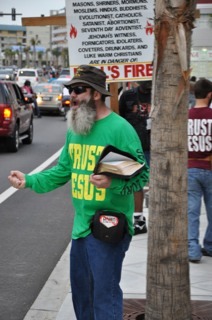 As it is written, "How beautiful are the feet of those who preach the good news!" 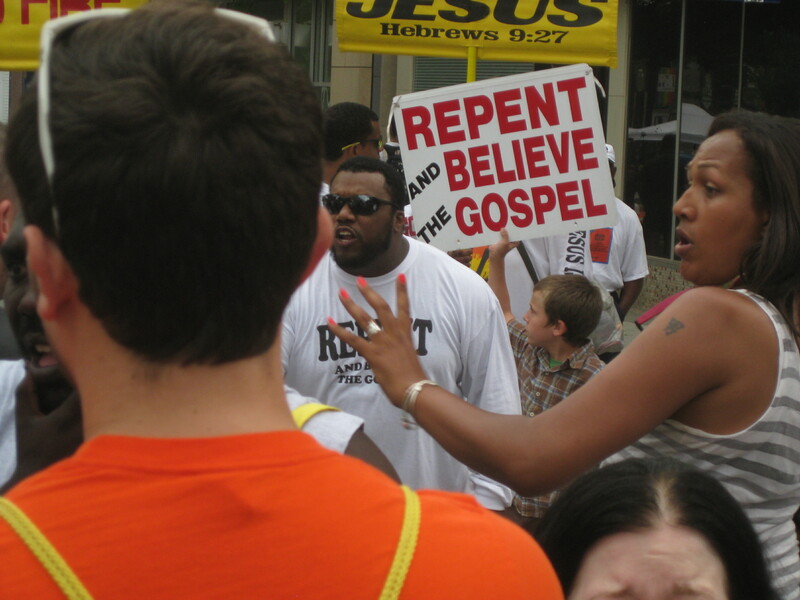 Yes…the good news is “Repent” for the Kingdom of God is at hand and available to all. 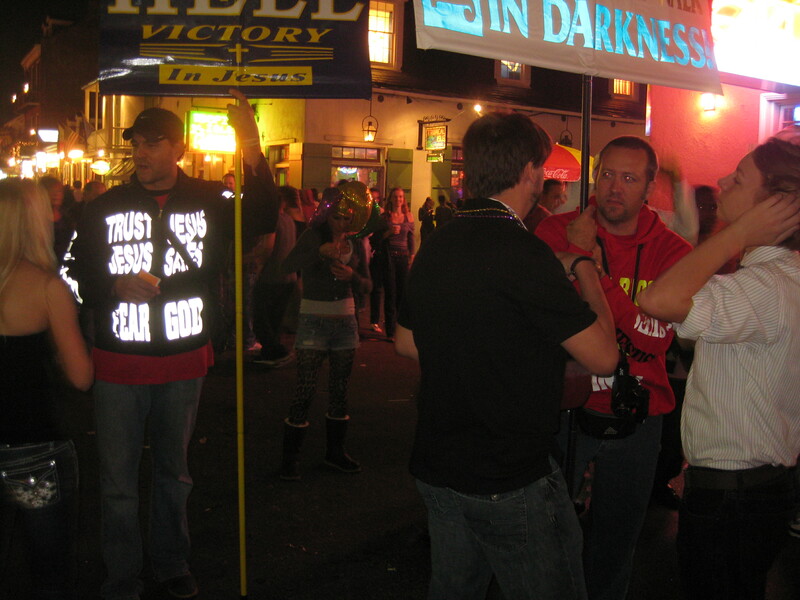 Through God’s grace and tender mercies a “few” yielded to the Holy Spirit to the salvation of their souls in the miss of the powers of darkness that dominated this festival. 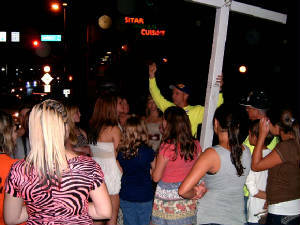 OH… the supernatural power of the gospel to save from this wicked and perverse generation. Jesus Christ reigns. Normally we that preach the “true” Jesus message repent for the remission of sins (Luke 24:46-47) do not see the fruit of our labor in the Father’s harvest on this side, but every now and then the Lord God Almighty allows us to see His power to save as we labor. Such was it here where a few lost souls shared their testimony of their transformation from the power of darkness to the marvelous light of the Lord Jesus Christ. 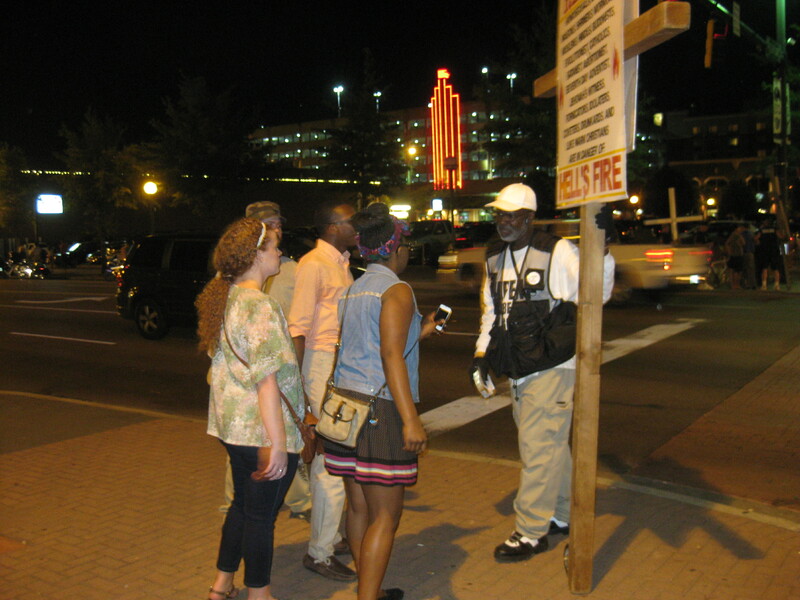 One such testimony came from a young man who came up to us at the end of Saturday night around 11:00pm and told us that he went home and called on the name of Jesus and Jesus revealed Himself to him at which point the young man asked Jesus to forgive him of his sins and save Him. This young man the next day sent Frank Long (Mountain Man) who ministered to him an email of his encounter and transformation with the living Christ. Halleluiah, glory to God in the highest. I pray that the Lord Jesus Christ will continue to give “His” called out ones the wisdom and boldness to continue to fulfill “His” command to go into the world and preach the gospel. Taking up our cross daily denying ourselves even unto death. 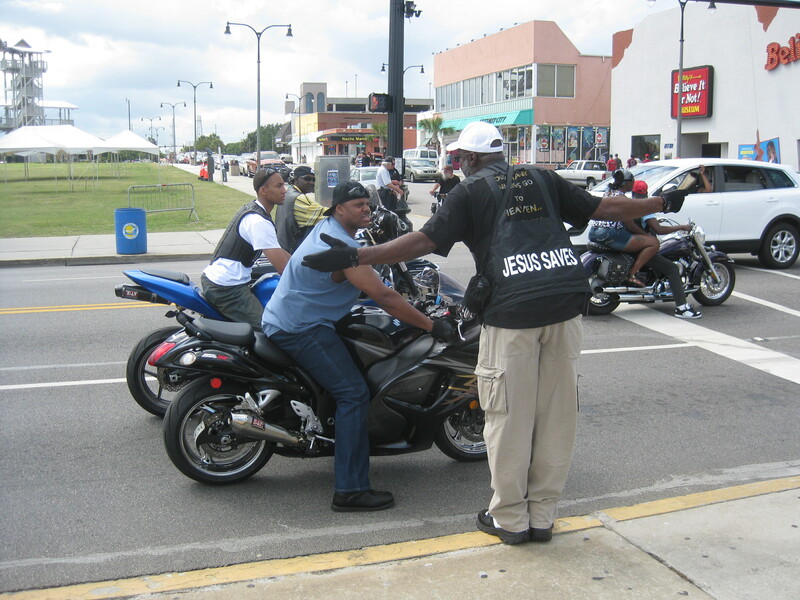 2011 Myrtle Beach, South Carolina Black Bike Week was hopefully left “Light”er this year due to the preaching in the streets of the gospel of Jesus Christ. 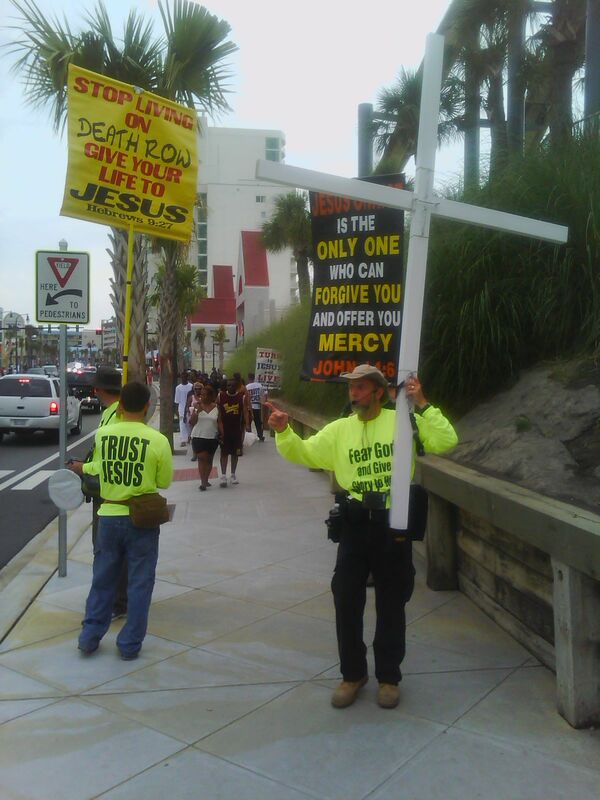 Myself, Frank (Mountain man) Long, Brian Cranford, Brian Younts, Scott Fitchett(NY), Pat O'Connell and his son in-law Jude spent two days and two nights walking up and down Ocean Blvd passing out gospel tracts, stopping for one on ones, and taking turns with the mega phones “Truth Horn” warning those who outwardly loved their sins that God’s judgment was near and their only hope to be saved from His wrath to come was through true repentance of their sins, and trusting in Jesus Christ. 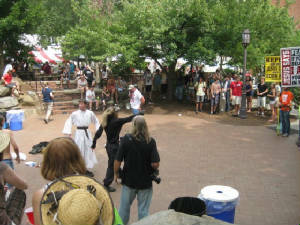 The projected attendance of this event was approximately 350,000 lost souls. 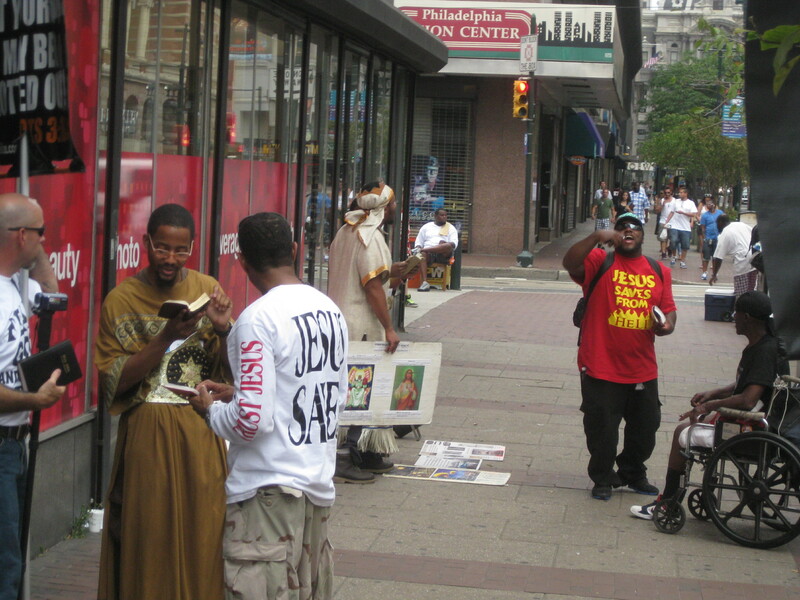 I believe this outreach to the lost was very fruitful for they did not only hear the word of God (Roman 10:17) they also could not escape any conviction of their sins brought about by the Holy Spirit. 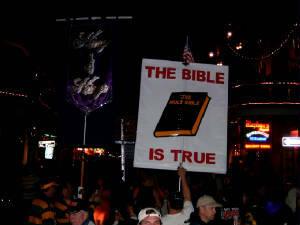 When they looked up as we came walking through the crowd with large crosses, banners, and signs with scripture and sayings rebuking, exposing the works of darkness, and pointing to the cross were the remission of sins is for those who believe and obey Jesus Christ. The Lord was gracious enough to give us this portion of His harvest this weekend to labor in for we certainly watered, and planted , and as Pat O’Connell would say and plowed, but we know that all power to give growth to the seed is the Lord Jesus Christ. May God’s will be performed in the lives of all those who attended this event. In this long draw out battle with the forces of evil, that is to be expected of “every” follower of Jesus who is enduring to the end this one fight is over and I press forward towards the mark of the high calling of Christ Jesus. 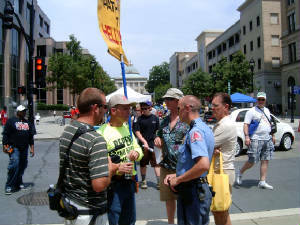 · At my June court appearance a deal was struck that the second degree trespass and disorderly conduct charges were dismissed by the State. · The resisting charge was deferred for 6 months with the agreement that if I didn’t pick up anything else they would dismiss this charge as well. 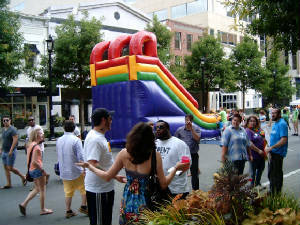 · At my November 17th court date the resisting charge was dismissed as well. As you can tell I haven’t been updating this website as in the past, and will probably only do so as the Lord leads. Over this past year I have been still preaching the gospel to every creature, getting my house in order, and praying that God’s perfect will be done in my life as I “follow the leading of the Holy Spirit”. Time is winding up, tomorrow is not promised, the road to eternal life has always been narrow where only a few will find. 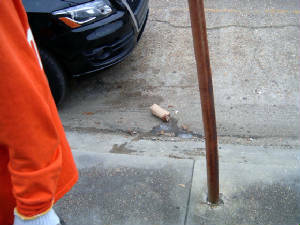 was given this bullhorn by campus "police". 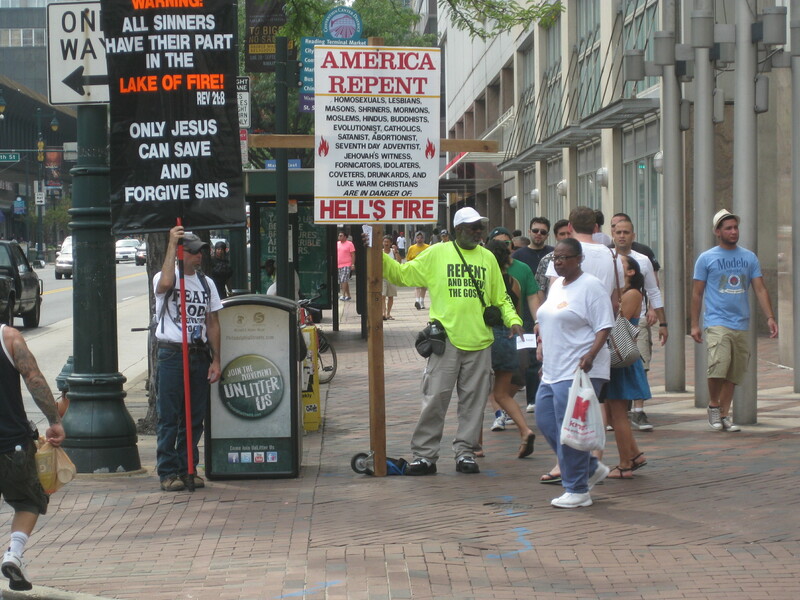 Mat 5:10-12 Blessed are they, which are persecuted for righteousness' sake: for theirs is the kingdom of heaven. Blessed are ye, when men shall revile you, and persecute you, and shall say all manner of evil against you falsely, for my sake. 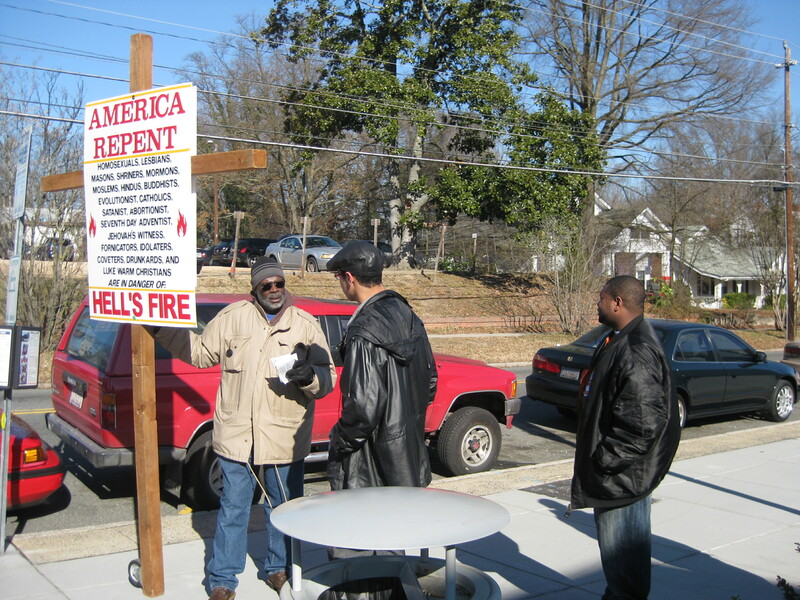 On January 6, 2010 Pat O’Connell, Ross Jackson and I went to North Carolina Central University in Durham, NC to preach the gospel. The actual area that we preached at is on a public sidewalk adjacent to the school’s cafeteria. 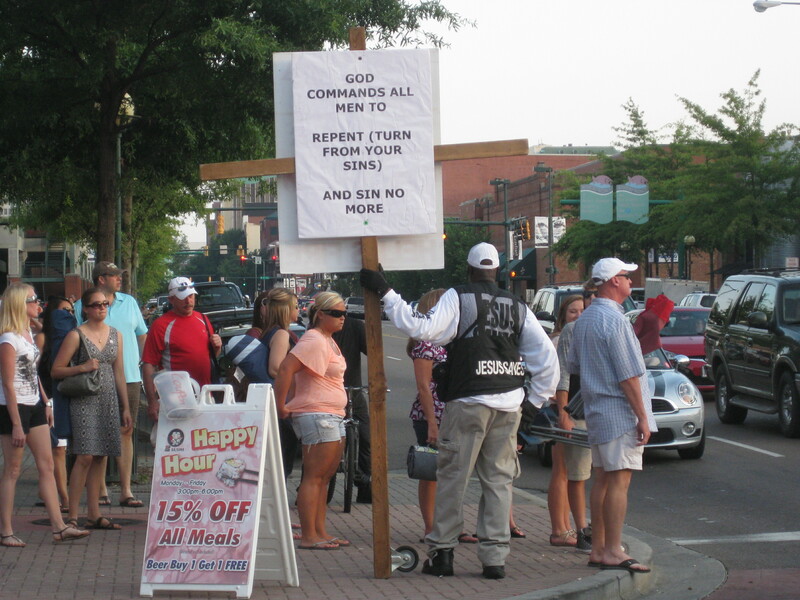 I have preached here on several other occasions in 2009 and have found the campus police to be very hostile towards the preaching of the gospel. 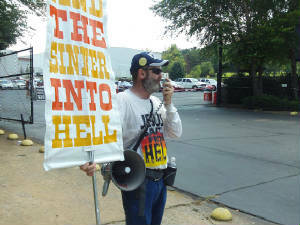 My first time preaching there I was told I couldn’t because that was the campus property. 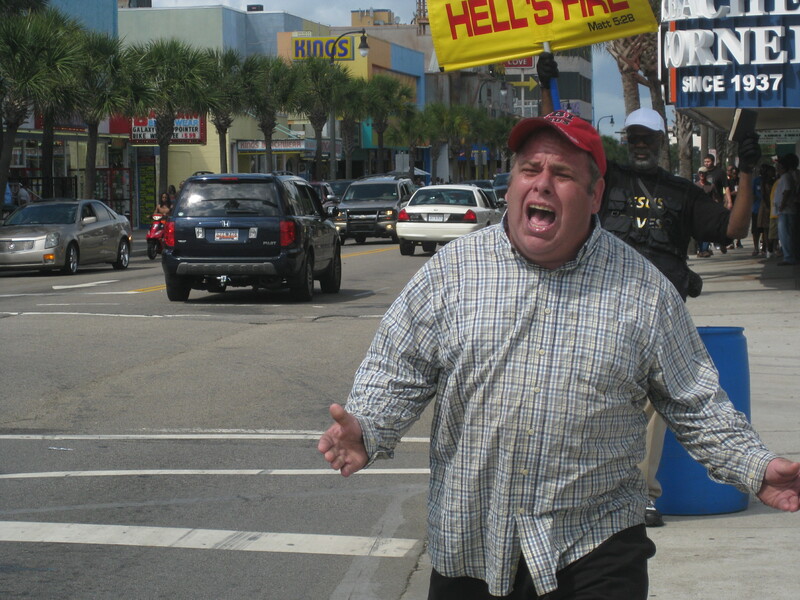 When I informed the officers that the sidewalk I was preaching from was actually the public sidewalk and not the campus property they acknowledged the fact. 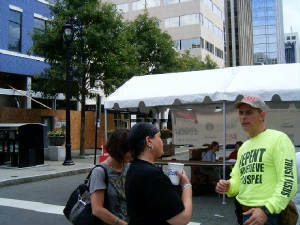 On this particular day of exercising my Freedom of Religion First Amendment Rights at approximately 11:30 AM we encountered the same officers who expressed that they didn’t agree with our preaching and was bias towards the students so much so they told the students we were wrong, and preaching a twisted gospel. 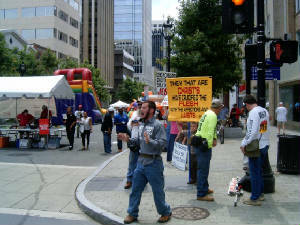 By saying things like the bible says that homosexuals shall not enter the kingdom of God (1 Corinthians 6:9-10), and that Jesus said in Revelation chapter 21 the fearful, and unbelieving, and the abominable, and murderers, and whoremongers, and sorcerers, and idolaters, and all liars, shall have their part in the lake which burneth with fire and brimstone: which is the second death, But he that overcometh shall inherit all things; and I will be his God, and he shall be my son. One of the campus officers had a bullhorn brought to him by another officer in a patrol car, which he later gave to a student to mock, harass, and confront us. We had no amplification devices. Shortly afterwards another officer watched the same student assault Brother Ross physically pushing him several times down the sidewalk. (Captured on video). 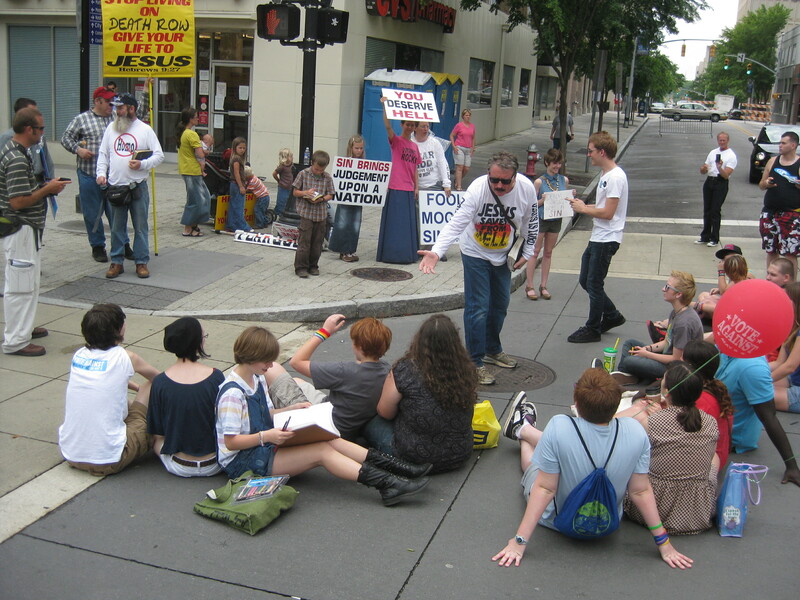 At approximately 2:00pm we were told to go to the other side of the street because our preaching was offensive. When I reminded the campus officers that we were on a public sidewalk exercising our freedom of speech I was told to go to the other side of the street or get arrested. I asked my fellow preachers to call 911 for a city of Durham police to resolve this matter. The commanding campus officer then told his officers to arrest me. The officer who gave the student the bullhorn then proceeded to grab my hand and arm and twisted it behind my back, threw me up against a car and proceeded to say I was resisting arrest because I didn’t pull my hands and arm down behind my back as he commanded so that he could hand cuff me. 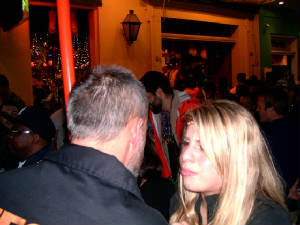 He told the female officer to pull her pepper spray on me. 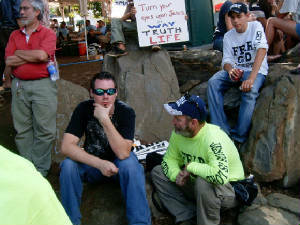 I told him and the assisting officer that I couldn’t pull my arm down because he had it in a lock position up my back. (This is also on captured video). 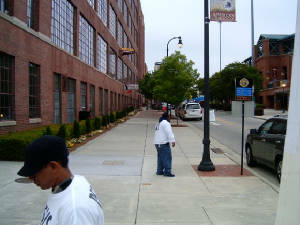 I was eventually taken to the City of Durham jail and booked and charged with second-degree trespass, resisting public officer, and disorderly conduct. My bond was set at 1,000.00, which I was eventually able to make, and was released at approximately 7:00pm with a February 02, 2010 court date at 9:00AM. It is a charge granted to me by my Lord and Savior Jesus Christ to go and preach the gospel to every creature, making disciples teaching them to observe all things He commanded. I’m driven by compassion to see the lost saved from hell and delivered from sin. Just as the Lord saved me, and continues to deliver me as I continue to endure to the end. For as He said: He that endureth to the end shall be saved. I have seen God’s grace and mercies being extended to lost souls just prior to their death through the preaching of this gospel. Some accepted the free gift many others rejected it in –spite of God’s will that they perish not. 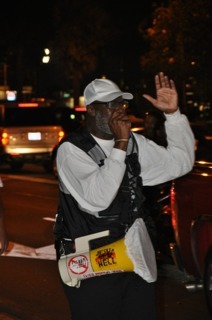 I am a law-abiding citizen, and have been preaching the gospel of Jesus Christ on the streets for over twenty years. My many encounters with law enforcement officers over this period have never resulted in an arrest issue. This incident tough stressful for my family and me have strengthen my resolve to continue to live holy and preach the gospel to the lost whether it be convenient or inconvenient no matter the consequences. You see Jesus called me when I was not even worthy to be saved. For when I was powerless to save myself, God chose in His own time to send Christ to die for the ungodly and save me (us) from our sins. The day I truly repented of my sins and believed on him, He took my heart of stone and gave me a new heart and a new spirit. Yes there were times that I fell short of His glory in my new walk, but through His mercy and grace I did not die in my disobedience and sins. Being convicted I immediately repented restoring that right relationship with a Holy and righteous God, and realize that through Him I can be an overcomer of all temptations (1 Cor. 10:13). Back to my arrest, as I have reflected on the circumstances surrounding this incident it is so clear to me of the spiritual warfare that was taking place on that day. The principalities, and powers working in the children of disobedience to not only keep them in darkness, but to hinder the preaching of the gospel of Jesus Christ which demands righteous, and holy living in and through Him. 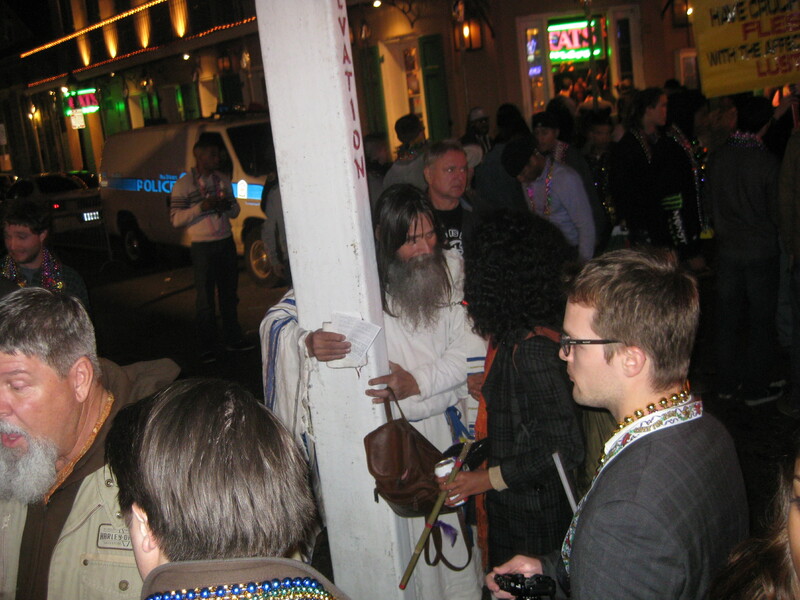 Case in point…right prior to the arrest was the height of the spiritual battle for souls. 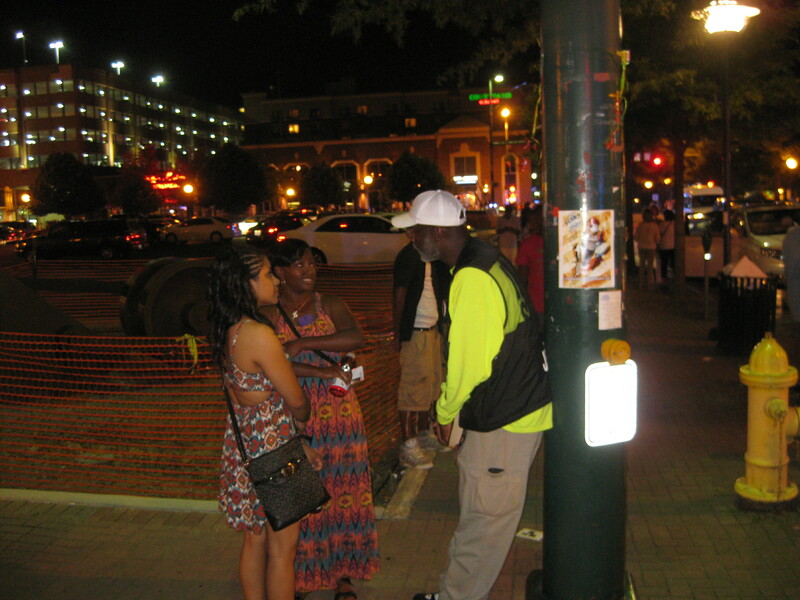 There were two young ladies that came to talk to me from the crowd why Ross was preaching. The first young lady told me that she believes what we were preaching was true, but how could she overcome her bisexual tendencies. 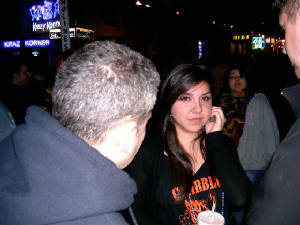 I shared with her that if she truly wanted to be victorious over those thoughts and sin, she would have to cry out to God, truly repent of her sins, and believe the gospel, and Jesus Himself would come into her establish a relationship with her, and give her a new heart and a new spirit along with power to overcome sin. 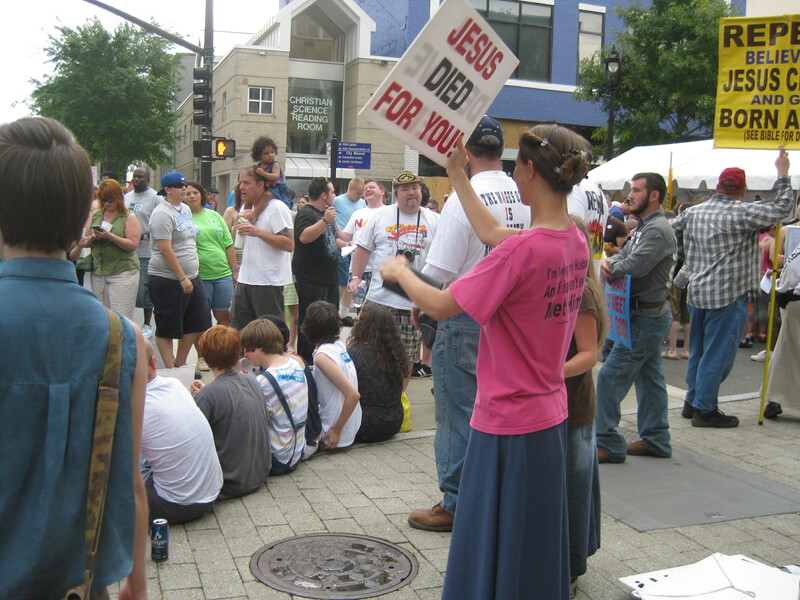 All the time I was ministering to her the hecklers were getting louder with cursing, and laughter at the preaching from Brother Ross, but where we stood just a few feet away there seem to be a encompassing peace and quietness in our area. I then prayed for the young lady that she had no more pleasure in her sins, and that she would submit to the Lord Jesus Christ and be saved. 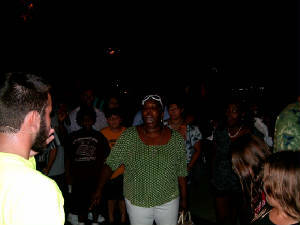 Immediately after praying for her the other young lady that was standing there, which I thought was with her but she wasn’t shared with me that she just got saved one year ago and appreciated the preaching of the gospel and that it encouraged her to live holy and righteous. 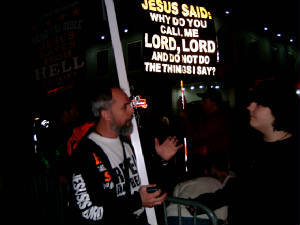 (For the preaching of the cross is to them that perish foolishness; but unto us which are saved it is the power of God). I pray to the Lord of the harvest that He will send forth laborers into his harvest, even though the work is not always pleasant and full of reproach, hard work, and dangers I know that He (God) is well able to equip, strengthen, and keep those that He sends in Jesus mighty name. For I too have lost love ones in the harvest that I pray that the lord will send someone across there path at the right moment and when they hear that living word of God that is quick and powerful, and sharper then any two-edged sword they will repent and believe to the saving of their soul in Jesus mighty name. Statistics tells us that 50% of high school Christians “will lose their faith” in college. These students are facing a hostile environment that “hates” the gospel of Jesus Christ, and supports, endorse and indoctrinate the students in secular humanism (It’s all about self, man is god, man determines his own values). In addition to the above many of the students are given false assurances of there salvation. 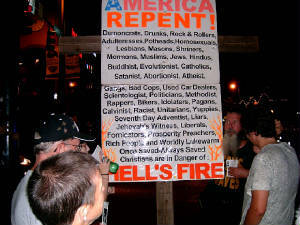 Being told they are saved while still living a disobedient life of sin, fornication, adultery, revellings (partying), drunkenness, and such, which the scriptures plainly says in Galatians 5:19-21 that those who do such things “shall not inherit the kingdom of God”. 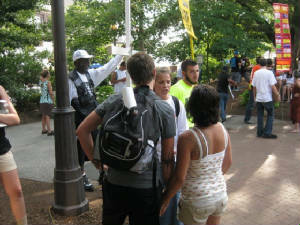 What must be done to save these students; preach the uncompromising word of God. God’s love, God’s grace, God’s mercy, God’s, wrath, God’s righteousness, God’s holiness, God’s (Jesus) soon to be return to judge the world just like in the day of Noah, God’s will that none should perish but that all should come to repentance. For Godly sorrow worketh repentance to salvation, but the sorrow of the world worketh death. The word of God is life and living it reaches that inner man that was created in God’s image to fellowship with Him in holiness, spirit, and truth. Let the students hear the preaching of the “whole counsel of God”, and then let them choose whom they will serve. Faith comes by hearing and hearing the word of God. 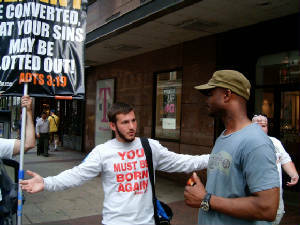 Except a man is "Truly" born again (By the Spirit of God), he cannot see the kingdom of God. Romans 8:9b; Now if any man have not the Spirit of Christ, he is none of his. Click here to contact me for prayer, comments, or questions.